Those of us concerned about Climate Change and other environmental issues have long advocated a shift from fossil fuels to renewables. My interest in this began even before the 1974 energy crisis. I, like many others, became very concerned about the Earth’s capacity to deal with all the pollutants we were releasing into the air, the water and the soil. We started advocating a Gandhian renunciation of materialism, a shift to simpler lifestyles and experimentation with renewable sources of energy. Using the sun and the wind to generate electricity had been known about since the late Nineteenth Century. Renewables didn’t take off because fossil fuels were too cheap and abundant and the macro level ecological crisis was too slow to be obvious to mainstream opinion. All that is suddenly starting to change: Climate Change is beginning to manifest as a clear and present danger, the incumbent fossil fuel economy seems ever more unfit for purpose and technical innovation in the Cleantec/Renewables sector is happening at breakneck speed. The death spiral of the global fossil fuel industry may happen more suddenly than anyone anticipated. The growth of solar power in USA is quite a revealing example of the growing rapidity of change. 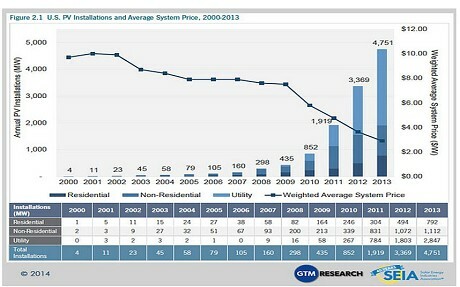 The blue graph above shows that the annual rate of installation of photovoltaics was 4 MW in the year 2000. At that time those of us advocating solar were dismissed. Solar was perceived as insignificant, and in terms of actual production of course it was. The price of solar has fallen steadily, the price of fossil fuels has been erratically upward, and key tipping points have been passed. By 2013 the annual installation rate had risen to 4,751 MW, over a thousand fold increase in thirteen years. One wonders what it’ll be in another thirteen years. Nobody is dismissing solar as insignificant these days! 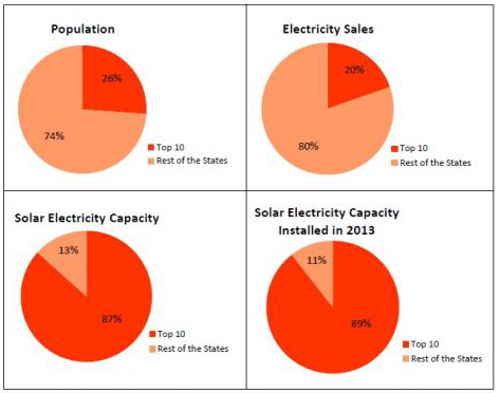 The red pie charts reveal much about how this solar revolution is unfolding in USA. The individual states within USA are developing divergent energy economies not based upon their renewable energy potential so much as on their differing levels of political, economic and legislative support. In 2013 just ten states, which account for only 26% of the population, installed 89% of all new solar capacity, whereas the other 40 states, with 74% of the population, installed just 11% between them. These top ten states include sunny California and Arizona, as one might expect, but they also include Massachusetts and Delaware from the cold grey Northeast. Large sunny states like Texas and Florida are not in the top ten, as the dominance of Climate Change denying Republican politicians and the lobbying power of the fossil fuel industry still holds sway in these states. The falling price of renewables and the rising price of fossil fuels are already impacting on businesses in interesting ways. Paradoxically the process of creative destruction, which is at the core of capitalism, is playing out in ways that favour the environment. Old inefficient power stations are following Concorde into rapid obsolescence, and the companies with investments in these technologies are losing money and going bankrupt. Money invested in fracking wells, deep sea oil and a host of other outmoded technologies are looking increasingly like stranded assets. Coupled with this is a massive lobbying effort from a host of environmental groups to promote disinvesting from the fossil fuel industry, just as civil society organised disinvestment from Apartheid South Africa. Three factors are coming together which may well trigger rapid and profound change in how humanity generates and uses energy: the growing need for massive and rapid action on Climate Change, the falling costs and rapid technical innovation in renewables and the depleting accessibility and affordability of fossil fuels. The possibility of a modern, affluent, urbanised future for humanity seems to be emerging based entirely on renewable forms of energy, and it may now at last be beginning to happen at breathtaking speed. This entry was posted in Business Investment, Climate Change, Economics, Energy, Environmental, Global, Politics on 28 August 2014 by Richard. Our car club goes from strength to strength. We’ve been up and running for just over two years, membership has trebled; we now have 38 households sharing 4 cars. Most of us find we walk, cycle, use public transport and lift share more and use cars less than we did before joining the club, which was all part of the original idea. As our numbers grow, we are thinking about getting a fifth car. We want it to be as ecologically sustainable as possible, yet practical and affordable. I would love it if our next car was not fossil-fuel powered. What are the options? Electric cars are really beginning to take a major market share in some countries. The Tesla S and Nissan Leaf have been selling more than any petrol or diesel models in Norway in recent months. As Norway gets virtually 100% of its electricity from renewables (mainly hydro) this makes sense, and as the Norwegians develop wind, wave and tidal energy it is logical for them to invest in converting transport infrastructure and domestic heating to electricity. However in UK, like most countries, our electricity comes largely from gas and coal, so converting to electric cars makes less sense. Only if we can recharge with rooftop solar and grid supplied renewables will it be worthwhile. The efficiency of the cars is also critical, and weight and speed are prime determinants. The Tesla S is quite luxurious, can go pretty fast and has a long range between recharges, so needs large batteries, weights 2,108 kg, so needs more power, meaning more weight. This is not very sustainable unless perhaps it is in a Norwegian context of abundant renewable energy. Lower top speeds, lighter weight and shorter range mean greater fuel efficiency, but the shorter range of some such vehicles was a factor why our car club didn’t buy one of these a couple of years ago. 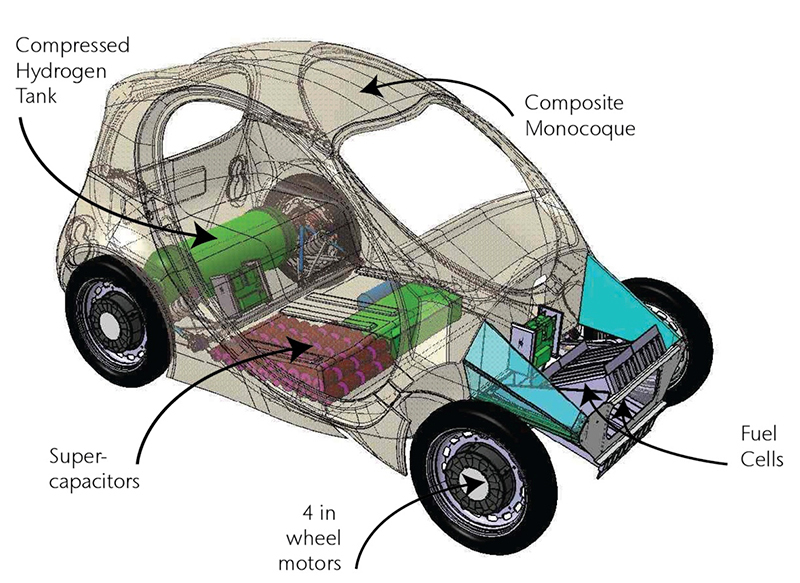 The Riversimple hydrogen fuel cell car looks to me to be the most ecologically sustainable car yet. I absolutely love the whole systems thinking behind the company, how they do business, how they have designed a 350 kg car which does over 200 mpg and why they plan not to sell them, but only to lease. However they are not in production yet. Hopefully they’ll be available next year, maybe even in Hereford. Then I’ll have to persuade the rest of the car club that they are a good idea, practical and affordable for the club as a whole. This entry was posted in Transport on 19 August 2014 by Richard. There appear to be two divergent ideas as to what a green lifestyle is. The first one focuses on simpler lifestyles, using hand tools and simpler technologies and is strongly associated with moving to the countryside and pursuing the dream of self-sufficiency as advocated by John Seymour and others. Many of us believed that millions of people would leave the cities and seek out a new way of living in the county as some kind of New Age peasantry. It was my dream from childhood. In my mid twenties I bought an old ruin with land (at a time when such things were just possible without huge financial resources) and worked my socks off renovating the ruin and attempting to grow a bit of food. This dream of moving back to the land, making self-build structures and growing food is still a popular dream. The Lammas Project in Pembrokeshire provides inspiration for millions of people. For many people the idea of a collapse of urban civilization associated with Peak Oil is part of this post industrial rural future. Meanwhile the planet has been urbanizing at breakneck speed. A new vision of a green lifestyle is emerging that is high-tech and urban. In the developed world urbanites tend to have on average lower carbon emissions than rural folk. In dense cities infrastructure can be organised in much more energy efficient ways. Cities like Copenhagen and Oslo are planning and implementing comfortable, affluent zero carbon futures. Car use is falling in most modern cities whereas rural car dependency is a major problem. The best of modern architecture is very energy efficient. Increasingly it is the case that 100% renewable forms of energy can supply reliable energy for heating, cooling, transport, domestic and industrial needs. Cities will not necessarily collapse as the oil wells run dry, but the transition away from oil does need to be well planned and the best investments made. The two photographs above encapsulate these two visions. One, the straw bale, turf roofed self-build at Lammas with the occupants holding a scythe and hay rake, embodying the spirit of rural New-Age Post-Apocalypse Self-Sufficiency. The other, The Crystal, built by Siemens in London’s docklands to showcase high tech low carbon urban futures. The Crystal has photovoltaic panels, ground source heat pump, rainwater and greywater collection and 3,500 sensors continually monitoring energy use and optimising the buildings performance. It is the first building in the World to be awarded both BREEAM Outstanding and LEED Platinum accreditation. Which inspires you more? Which will provide a more useful indicator of our future? Maybe many of us will live and work in energy efficient high tech cities for most of the year and holiday in simple structures while re-connecting with nature for a few weeks over the summer? Visions of the future do not need to be exclusive: they can merge and cross fertilise in interesting and fruitful ways! This entry was posted in Buildings, Environmental on 11 August 2014 by Richard.